Considering that Toccata Classics specializes in bringing to light obscure repertoire, it is little surprise that they are not often involved in television tie-ins. In fact, the background to this CD sets the whole project apart from standard Toccata fare. 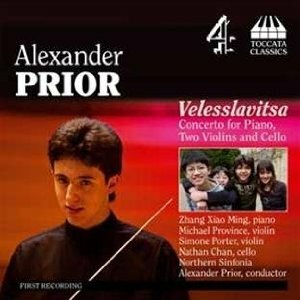 Velesslavitsa grew out of a series on UK’s Channel 4 called The World’s Greatest Musical Prodigies. If that sounds trite and sensationalist, then the quality of the music that results will come as a pleasant surprise. The premise of the series was that the talented young composer/conductor Alexander Prior would travel the world in search of similarly talented young performers, for whom he would then write a work. The group he assembled consisted of two violinists, a pianist, and a cellist, so he then set to work creating Velesslavitsa, a concerto grosso that was played by them under his baton and accompanied by the Northern Sinfonia as the culmination of the final episode. Listening to the recording, it is easy to forget just how young the participants were. Prior was 17 at the time, and his soloists ranged from 10 to 15. The music he writes for them isn’t particularly virtuosic, which comes as a surprise. Instead, he seeks—so he tells us in the liner—to represent their personalities: Province as sensitive, Porter as precise, Chan as expressive, and Chan as lyrical. In terms of composition, Prior has a lot of competing demands to balance here. These portraits of his four soloists must fit into a single stylistically unified work, and one that will hopefully find favor with a television audience. Then there is the orchestra to think about, and he must also use the opportunity to present his compositional voice to this wide audience. Astonishingly, he manages to cover all these bases, presenting a work of considerable artistic merit, whatever criteria it is assessed against. Prior is half Russian (on his mother’s side) and the work was written shortly after he had completed undergraduate studies at the St. Petersburg Conservatory, where he had been the youngest pupil since Prokofiev. Russian music of the Romantic era is his starting point, and the many Russian dimensions of the work are clear from the outset. The title is Russian, and refers to the god of music in ancient Slavic cultures. The concerto is large and sprawling, but retains a sense of unity through the recurrent use of a Russian Orthodox chant. Prior takes every opportunity to show off his imaginative use of the orchestra, but even this is never just for effect. The orchestration continually varies, but is surprisingly economical, with everything in the ensemble always seeming to happen for a good reason. My one criticism, and it’s something common to all prodigy composers, is the amount of undigested influence that often comes to the surface. The first orchestral exposition sounds like it has been lifted directly from Boris Godunov, and later on the style comes dangerously close to Shostakovich. There is also a good deal of Bruckner and Wagner in the finale. In his efforts to fulfill all the many functions expected of this work, Prior does go on a bit too long. The Grave central movement would be more effective if it where half the length, and the coda of the finale seems to go round in circles for a few minutes, which is all the more frustrating given that the ending, when it comes, is disconcertingly abrupt. Both the performance and recording are excellent, and neither suffers for being taken from a live performance. Prior the composer is often daring in the ways that he moves unexpectedly between different moods and tempos, but Prior the conductor is able to demonstrate the innate logic behind each of these shifts. The sound benefits from the fine acoustic at the new Sage concert hall in Gateshead, and the woodwind and percussion soloists come across with particular clarity. A recommended release, then, and one that ought to appeal, for different reasons, to a number of different classical audiences. The introduction by Martin Anderson in the liner mentions that the television program for which the music was written did not include the piece in its entirety. That seems like a shocking omission, so all credit to Toccata Classics for giving us the chance to this fine work in all its glory. Stockhausen’s epic opera cycle LICHT poses huge problems to anybody trying to stage it, record it, or even get their head around it as a listener. Fortunately though, despite its huge scale, the constituent operas are made up of individual acts that can stand alone and that can be appreciated with just a minimal understanding of the overall context. MICHAELs REISE UM DIE ERDE (Michael’s journey around the world) follows a typically eccentric scenario. The work constitutes the second act of DONNERSTAG, which focuses on Michael, the guardian angel of mankind and one of the three central characters of LICHT. The first act tells of Michael’s childhood and youth, and culminates in a rite of passage in the form of a music exam. What is it with Stockhausen and music exams? A whole act of MITTWOCH is devoted to an orchestral audition, not an obvious subject for operatic drama. But then, LICHT is only opera in the most tenuous generic sense, as MICHAELs REISE amply demonstrates. The music here is wholly instrumental, with two soloists representing the main protagonists: the trumpet (Marco Blaauw) as Michael and the basset horn (Nicola Jürgensen) as Eva. The journey around the world takes in seven stops, beginning in Cologne (naturally) and then proceeding to New York, Japan, Bali, India, Africa, and Jerusalem. Not that you’d work out any of this from the music itself, which studiously avoids any regional or ethnic color to give us an idea of where we might be at any given moment. That’s probably just as well, given the very un-PC associations that Stockhausen attaches to many of the destinations. New York, for example, is chosen to reflect conflict and war (connections here perhaps with the composer’s controversial comments about 9/11 some 20 years later), India represents “temptation and decline” and when we visit Africa it is for an encounter with death. All of this can be safely ignored though as we listen to the music. The concept of flight was central to Stockhausen’s theology, and it is the one aspect of the scenario that is meaningfully conveyed through the music. The work’s sections are connected together attacca into a single span, and for the most part the two solo instruments ‘fly’ over the ensemble accompaniment, giving a feeling of airborne propulsion over steady and sometimes gradually evolving pedals in the orchestra. Brass instruments predominate throughout, especially at the opening, which is an aggressive duet between the trumpet solo and a solo trombone. The tuba in the ensemble also comes to the fore later on, acting as another adversary to the trumpet. We also hear some spiky woodwinds in the ensemble, and towards the end what sounds like an electronic organ of the type you might associate with early Philip Glass. There are also apparent stylistic allusions to free jazz in a few sections, with walking plucked bass under some laid back jazzy licks from the trumpet. Are these allusions deliberate? Either way, the ease with which they integrate into the texture demonstrates the relaxed and undogmatic nature of the music throughout the work. The playing and recording here are excellent. The soloists and the ensemble enter fully into the spirit of Stockhausen’s surreal enterprise, and the recording projects a real sense of drama, especially in the many and varied articulations from trumpeter Blaaw. We don’t hear as much of the basset horn as the scenario suggests we should, leading to the suspicion that it is often obscured beneath the trumpet sound. As with most of LICHT, this act clearly relies heavily on the stage action to make sense, so an audio recording only gives part of the story. Even so, being a purely instrumental section, the audio-only experience has a certain self-sufficiency and internal logic. In fact it could be argued that some instrumental sections of cycle can only be fully realised in audio-only recording. 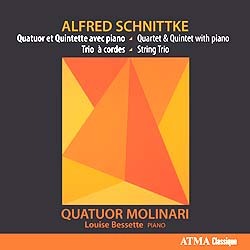 Listen, for example, to the Arditti’s excellent recording of the Helicopter Quartet (Scene Three of MITTWOCH—Montaigne Auvidis 782097), in which the sounds of the strings and the helicopters balance far better for being mixed in a studio than could ever be achieved ‘in-flight.’ That said, MICHAELs REISE is presented here in a live recording. There are no helicopters in this scene, although there does seem to be plenty of flight, with the two soloists regularly up in the air on trapezes. 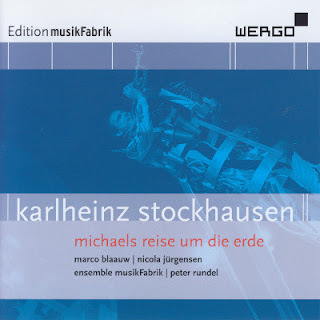 As in almost any Stockhausen project, the sound engineers have clearly been posed a unique set of challenges to recreate the experience in an audio recording. Fortunately, they succeed, and the results are as atmospheric and engaging as any Stockhausen fan could wish for. Delitiae Musicae, Marco Longhini – cond. 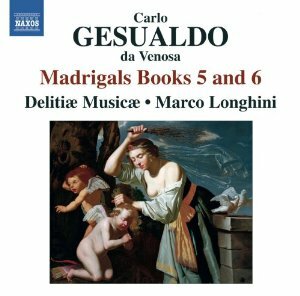 This 3-CD set brings to a close Delitiae Musicae’s cycle of Gesualdo Madrigals for the Naxos label. Standards have been consistently high throughout the series, and his last volume is no exception. Italian singers, performing in their native tongue, ensure that the performances are always led by the words, and the discursive, and occasionally declamatory, settings find the ideal balance here between music and text. By this late stage in the Gesualdo’s career, the harmonies have become truly strange. Or rather, unpredictable changes of harmony and inscrutable dissonances appear in the textures with alarming regularity. Where other choirs may be tempted to highlight these incongruities, Delitae Musicae and conductor Marco Longhini instead integrate them into otherwise flowing and lyrical readings. The style of performance here would equally suit the madrigals of Monteverdi, with flowing lines, supple phrasing and a keen focus throughout on beauty of tone. This means that when the strange harmonies do appear, they are even more disconcerting, and being fully integrated into the otherwise consonant textures, they imbue the entire works with their strangeness. Tempos are slow in many cases, and dynamics are often subdued. The singers rarely attack the consonants, allowing a more open and vowel-led sound to result. Even the heavily-rolled ‘r’s help the music to flow. The all-male ensemble sings at a slightly lower pitch than on some other recordings, and the bass, Walter Testolin, occasionally has to plumb the depths. Fortunately, his lower notes are all secure, and the rich, bronzed tone he has in every register is just as evident here. The recording was made at Chiesa di Santa Maria Maddalena, Novaglie, Verona. The acoustic is clearly that of a church, but the singers are miked close, so the result is warmth rather than resonance. One disadvantage of this setup is that the words are difficult to make out. It is clear from the performance style that the words are leading the music, especially in the passages where the singers drain the tone from their voices to create almost a speaking effect, but even here the individual lines of text are difficult to make out. Perhaps Gesualdo himself should take some measure of blame for this. It is hardly the worst thing he ever did, but in his pursuit of radical harmonic and contrapuntal effects, he often obscures the words with the complexities that he creates. Delitiae Musicae rarely gives the music more clarity than it seems to need. There are many occasions where the singers all meet in the mid-register, all doing different things and without any clear hierarchy. In this reading, the resulting disorder is allowed to stand, giving all the more contrast between these sections and the more open and homophonic passages that intersperse them. But above all else, it is the grace and elegance of these readings that make them stand out. Gesualdo is all too often presented as a composer of music that is completely different from anything of his period. That often means heavier textures and a more aggressive approach. But Delitiae Musicae demonstrates that this is undoubtedly music of the early 17th century. These madrigals don’t need the singers’ help to sound distinctive, so it is great to hear a performance that celebrates their sheer musicality instead.